“Labels just give kids an excuse to misbehave.” The words sank to my very soul. Did she really say that about my precious son? There I stood, speechless on the steps of the little library in the small Oregon town we had recently moved to. I had my newborn daughter in her car seat in one hand, my 20 month old toddler waiting patiently beside me and in front, my screaming three year-old son. Screaming because the library was supposed to open at 10 a.m. It was two minutes past ten. We had waited in the car until 10:01, just to make sure a situation like this would not occur. It was commonplace in our household then, and now, to watch time very carefully so as not to upset the delicate balance of my son’s Autistic tendency of relying on time. We had just gotten out of the car and headed up the steps. The sign above the door said open, but when my son’s hand reached for the handle, it did not turn. I knew it was coming; immediate frustration. I tried my best to calm him. “Labels just give kids an excuse to misbehave.” She said cooly. In shock, all I could do was let my jaw drop open and hold back the tears. A minute later the door to the library opened and the woman pushed in front of our foursome to get to her important library business, shaking her head impatiently. The screaming stopped as soon as we entered and my boys went to the beloved children’s section while I found a spot to get comfy and feed my littlest one. We spent a few quiet minutes in that place but my mind was racing. I continued to stifle the tears until I had put all of my children back into the car and headed to my husband Aaron’s work. I couldn’t go home just yet. I needed to share my heart with Aaron, who worked only ten minutes away. As soon as I turned the key in the ignition, I could hold back no longer and tears started to stream down my cheeks. “Are you okay Mommy?” came a sweet little voice from the back seat. “Yes Noah, Mommy is okay. Sometimes Mommies cry too.” So many thoughts rumbled around in my head and my heart. This woman had no idea what life was like at my house. From her appearance, I supposed that her children were grown and gone and blissfully “normal.” To this day I’m sure she has no idea of the scar she left on my heart that morning. I arrived at Aaron’s work, sobbing, as the boys made their rounds to all the friendly people with whom he worked. I told him all about it and of course he came up with several comebacks on the spot, a talent I’ve often been jealous of. When I had calmed down and was able to drive home, God gently reminded me of the birthmarks. The day at the library was just the beginning. It was the beginning of the absolutely heartbreaking days that have come since. It was the beginning of the ignorant and judgmental people who come into our lives for a split second. It was the day I realized that our other children would be deeply impacted by their oldest brother. The little voice in the back seat was my second son, Noah, who has graciously taken on the role as the older brother and keeper of his mom’s heart. On that day at the library the word “label” was used. Thinking back on it, labels tell us important information: who made it, who manufactured and how to care for it. The matching birthmarks on my son’s and my shoulders and jaws are labels. They remind me that God made Titus just the way he is for a delightful purpose. He manufactured this wonderful blessing in our family. He is the one I can choose to look to for how to care for my children. On the challenging days I KNOW in my heart that God says I am the best Mom for my son. That little son is now taller than I am and just went to his first prom. There are still challenges and screaming as well as ignorant and judgmental people; it comes with the realm of autism. Along the journey, we’ve also met some amazingly talented and caring people who have helped our son grow into the cool teenager that he is. Life is so not “normal,” but I’m thankful for it. I’m thankful for the stronger relationship with my husband that wouldn’t have formed without the challenges. I’m thankful for the other three amazing children who are who they are because of their oldest brother. But I’m mostly thankful for God’s faithfulness to me in providing the labels. Karen and her husband, Aaron, reside in upstate New York. She is the mother of four amazing kids, ranging in age from 8 to 14 and along with Aaron has just finished writing a book about the adventures of parenting a child with Autism. 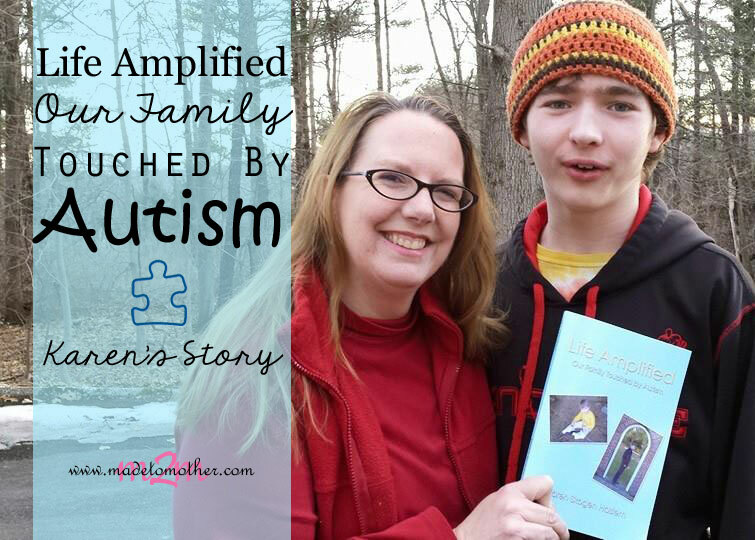 Learn more about Life Amplified – Our Family Touched By Autism and purchase a hard or ecopy of their book. 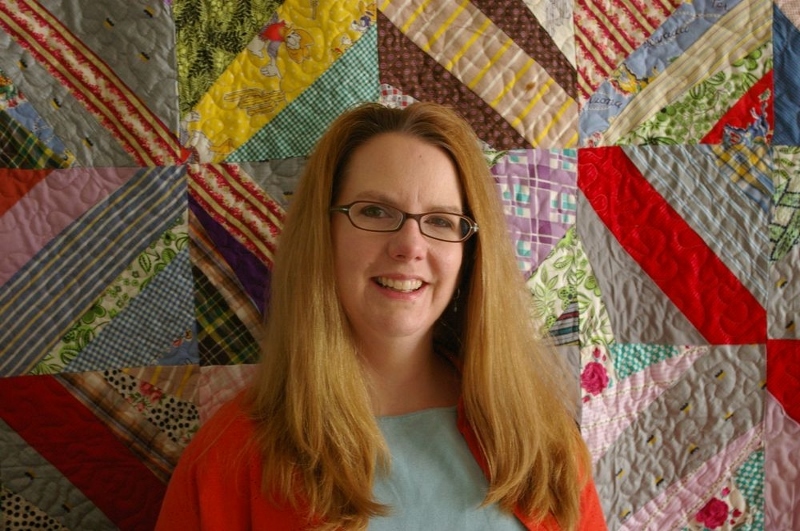 In addition to being an author, cook, housekeeper, nurse and head chauffeur of their home, Karen also runs a quilting business out of her home. 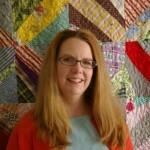 You can see more information about the amazing quilts she makes through Quiver Full Creations at www.facebook.com/QuiverFullCreations. Wow…Karens story brought tears to my eyes. The cruelty of others is heartbreaking. I am happy they found strength to overcome peoples horrific behavior. Thank you for reading it… I was honored to write it. So glad Karen shared her story! I wasn’t even aware of the birthmarks, but I have shared her story of hope with countless others when it comes to wondering ‘do I have what it takes to mother this child’. Yes, because God doesn’t make mistakes! Thank you friend…for being there on bad days ! Love you bunches. Hey Karen! So enjoyed reading this post. You are gifted with words and I look forward to reading more, my friend. Thank you so much… I look forward to writing more ! Karen you have always had a kind heart and spirit, now I also know that you are a talented writer. Your family is blessed to have you. God is good to us ! Karen – this is beautiful! I’m so glad it was shared on Salt & Light this week! What a beautiful story. Your son was hand-picked by God to be in your family, and has the birthmarks to prove it. Praying you have a blessed Resurrection Sunday! Love how God gives us what we need, even before we realize we need it ! Thank you for sharing your beautiful story – it’s a valuable reminder to be aware of every word that drops from our mouth. If we could only ALL give words that uplift and encourage… what an easier job the difficult days would be. Truly, the Lord blessed both you and your son by putting you together as mother and son. Thanks for stopping by M2M! I’m glad you enjoyed Karen’s story and I hope you come back for more inspiring mom stories! Thank you..we ARE so blessed. Oh wow…what a story of how easy it is to let OUR lives be the standard against which we measure others. But the standard should be Jesus…with His love, His compassion, His eyes and ears and hands to reach out with that love and build strength in those who are vulnerable. Thank you for sharing this! Thanks for stopping by M2M. I hope you come back soon to read more inspiring mom stories! Thank you Kate for reading it..I was honored to write it. Thanks for stopping by! Please come back for more inspiring mom stories! It’s a wonderful life we have .. thanks for reading. God wasn’t surprised that day when your son was 3 – He knew what your son needed, the challenges he would face – and the great love you had to help him be the man God created your son to be. So many people do not understand that God didn’t create cookie-cutter people – each are unique – in everything. I learned that – with one son who hears in an out-of-the-box way – and God gave him to a mom who would fight for him – in prayer and real life! Thank you for sharing your story – and the beautiful heart in it! We’ve always told our children..God doesn’t make mistakes. This brought me to tears. I am an autism mom myself and I have felt some of these similar things and been told some equally painful things. The strength that we can find in knowing these children were meant for us is something we can hold onto. We have lost many friends because they do not understand our child or our situation but then again we have gained many loving friends who do everything they can to understand. Thanks for sharing. I found you on a link party. This was a very touching and powerful story. Thanks for sharing! You are an amazing person. First, I think you and your son are amazing! The story of the birthmarks really touched me. Second, my heart hurts for you because as an elementary teacher I have seem some of these same misunderstandings or biases in the education setting. I have a 3rd grader right now who is a verbal, autistic child but he views things differently and as a teacher I need to understand that in order to be the best teacher I can for him. Thank you for sharing this beautiful story at The Weekend Brew. Karen, thank you for sharing the pain and beauty of your story. What an incredible testimony to God’s divine hand in your life…matching birthmarks. Love. I plan to share this with a friend whose oldest son is autistic Glad to be visiting from #TellHisStory. Some people do not mean to be cruel, but are brash and ignorant in many ways. The birthmarks are amazing. When our foster daughter was young, and we were shopping together, the clerk noted to her that she looked just like her mother (me). She was very pleased, and I was dumbfounded. I was brash in many ways in my young life, but hopefully I have mellowed out not that I am older. Thank you for sharing and giving us such good information at Tell me a Story. It sounds like you had a tough road which has now smoothed out. There are always going to be those who don’t understand. Sounds to me like she never had children, thanks for sharing your heart. Followed you here from the WW link up. I am so glad to have read this story. It is so very encouraging to read about how hard, painful things, unfair things, don’t define who we are, or what God is like. What an absolutely BEAUTIFUL post! As a mother of a 24 year old autistic daughter I can identify with your story! Thanks for taking the time to write and encourage others! Karen you have a way with words. I’m so sorry that happened to you many years ago. People can be so cruel. Thank you for sharing your story with us.